Every day, I receive calls from people who want to know how to become an executive recruiter. After listening to their questions, I can honestly tell 90% of them to choose other careers. Many don't know what the recruiting business is about, except for what they've read about the profession's better-known trophy hunters. To them, the work sounds romantic and mysterious. They're intrigued by the "behind-the-potted-palm" meetings while the search executives stalk candidates for top-level jobs, gaining a five- or even six-figure fee for finding them. So why couldn't you do that? Perhaps you can, if you have certain traits and skills. But looking for candidates is the tip of the iceberg in this profession. First, you need to find companies that will pay you to do so. This part of the search business is pure sales, and high on the list of required skills is the ability to communicate. No employer wants to pay you a fee to find candidates. They believe they can find a pearl among the many smelly oysters on their own, and often they can. Executive recruiters are engaged only after companies have exhausted all other avenues. At that point, you're expected to present them with only those oysters that contain pearls. If you like sparring with corporate gatekeepers and enjoy hearing "no" 95% of the time, you'll love the recruiting business. Even in a booming economy when recruiters have more assignments than qualified candidates to fill them, the start-up months can be brutal. That's why the great majority of rookie recruiters never make it past their first year. In my 25-year career as a recruiter, I hired several hundred people who thought they'd be successful. Of those, only 13 stayed long enough to actually succeed. Roberta Weller, president of Roberta Weller & Associates, a Las Vegas search firm, is one of them. Formerly a staff accountant with a public accounting firm, she became a recruiter in 1974 and has carved out a unique niche in the information technology field. "For those who last past that magic first year, it's an addictive and rewarding business," she says. "There's no sweeter sound than having a candidate you searched long and hard for say 'yes' to an offer from an employer who has probably changed the job specs a dozen times and turned down super people for frivolous reasons." Ms. Weller attributes her success not so much to her search skills as to her client development abilities. She belongs to several professional organizations where she networks with potential clients. "I don't consider myself a great recruiter," she says. "I'm much better at keeping clients for the long haul. That's what has kept me going through the tough times." Few entrants earn the million-dollar annual paychecks that search superstars take home. Most executive recruiters spend their days filling mid-level managerial and professional jobs. Only a small percentage are assigned boardroom or senior-level searches. These few have cultivated their client base for years and know all the movers, shakers, cultures and personalities in the industry, as well as the types of candidates these companies actually want. No matter how carefully worded the job descriptions, they know when certain finalists can't be taller than their bosses...or have more hair...or a more prestigious degree. Even then, some clients hire the least qualified finalist because they like them better (the "halo effect") or they interview better (the "actor factor"). Successful recruiters know they're retained to provide solutions to client problems, not just "fill slots" in an organizational chart. They also know the marketplace better than their clients and can uncover candidates in places a hiring authority with tunnel vision wouldn't think to look. That's why recruiters are paid big bucks and the process from neophyte to search celebrity is a long and bumpy ride. Knowing how to communicate means more than being an Elmer Gantry, the evangelist in the Sinclair Lewis novel. It means painting persuasive word pictures for clients and candidates. To understand a client's needs, you must convey that you've practically "been there, done that." To convince a happily employed executive to consider becoming a candidate requires extraordinary persuasion and evaluation skills. A search resembles a research project that produces a hundred or more possibilities who must be contacted and weeded until a final list is ready to present. Some neophytes learn enough jargon about an industry specialty to land assignments, but the test comes when they present their final slate. What appears to be a relatively simple search can suddenly blow up. Your perfect candidate says something goofy in the interview. The company changes the job specifications at mid-search, flushing weeks of work down the drain. The subtle skills separating superstars from also-rans boil down to industry-specific training and a "sixth sense" that comes from a long indoctrination in the trenches. I once conducted a telephone interview with an advertising executive at an Oklahoma oil company whose qualifications seemed ideal for a position at a classy Minnesota ad agency. References all extolled his mastery of advertising. After interviewing him by phone, the client was equally impressed and asked him to fly to Minneapolis. Two of the agency's executives met him when he stepped off the plane. Their top candidate sported a large handlebar mustache, no teeth, a ten-gallon hat, buckskin jacket and bright yellow cowboy boots. He never made it past the airport. A glint in the eye. Recruiters are the ultimate "spin doctors." As such they are always "on" and must exude enthusiasm. Without being abrasive, they must be a cheerful conduit between two parties trying to advance their own, often disparate, agendas. The ranks of successful executive recruiters are filled with those who view the glass as half full. Some searches are no-brainers, but most take unimaginable twists and turns. 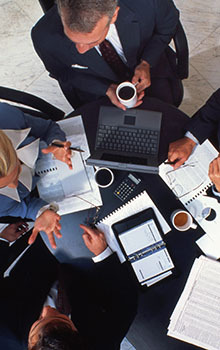 Trying to fit an interview into the schedules of two or more busy executives can take an interminable amount of time. Then, even if both sides like each other, the time required to make a final decision can seem endless. Issues include: For the company: Should we make an offer? To which candidate? At what salary? A committee decision (and most are) can take even longer. For the candidate: Will the company make an acceptable offer? Will this career move be in my best interests? How will my family feel about it? As facilitator, you must have the confidence and trust of both parties to move the process along without appearing to be self-serving. Executive recruiters shouldn't be confused with social workers. The point of a search isn't altruism; it's for the recruiter to collect a fee. This doesn't mean trying to force-fit the wrong person to the job, but the mating game must progress beyond the blind-date stage. Ultimately, someone must agree to uproot and take the job. This may require companies to accommodate candidates whose innovative notions aren't compatible with the current status quo. Does the company need a clone of the previous incumbent or an "out-of-the-box" hire? Must candidates come from direct competitors or would executives from a peripheral industry better serve the client? More companies are looking outside of their traditional talent pools, and recruiters must know when to introduce candidates with new perspectives. Not every search for a new executive starts from scratch, but extensive research is the foundation of every new effort. Knowing where to look is pivotal. Recruiters also must be resourceful when attempting to reach ultimate decision makers who are protected by layers of naysayers. Familiarity with your niche business segment or functional discipline is essential. Lacking the right background can add months to a successful outcome. Hiring is stressful for employers. So is changing jobs. Understanding these pressures is crucial to helping both sides feel they finished as long-term winners. You must see things as they really are rather than as clients or candidates want you to see them. Companies often don't know the realities of the marketplace, while candidates who haven't changed jobs for years may not understand their true worth. Only alert and sensitive executive recruiters can recognize these misperceptions and correct them before they derail a likely deal. Successful recruiters juggle eight to 12 assignments at a time. It's a high-wire act with no net. Deals you worked on for weeks may fall apart, but you can't stop to mourn the loss because you must keep smiling and dialing for an assignment to replace it. From the beginning of the process (your initial call to a hiring authority) until the hopefully happy conclusion, you're a mediator, go-between and diplomat who balances everyone's interests. If you have these attributes and want a crack at the high-stakes executive-recruiting business, where do you begin? You could start your own business, but without prior experience in the field, failure is almost inevitable. The landscape is littered with talented sales and human resources professionals, former executives and other wannabes who tried to become executive recruiters without the proper foundation. You can't earn a college degree in the discipline. It's a learned skill and the best place to acquire it is from a mentor at an existing recruiting firm. To find a good firm, ask a dozen hiring authorities to name three top recruiting firms they admire or respect. The same firms will likely be mentioned repeatedly. Call the managing partner and tell him or her you're interested in the field. Ask if you can come in to discuss the possibility of working there. Search firms are always looking for good people, and if they sense you have the right attributes, they'll probably offer you a chance. The recruiting industry has grown dramatically since I entered it nearly 30 years ago. U.S. revenues now total $6 to $8 billion annually. Business is so good that successful recruiters are turning down assignments. Industry growth should continue even if the economy falters, because companies recognize the value of using recruiters, especially as they continue to re-engineer and restructure. Is there room for new blood? You bet. But before jumping into the profession, know what's required for success. Those who do this important homework may reap the benefits of a rewarding new career.